Do you know someone having a 40th birthday or special birthday? If so, then these Birthday Personalized T-shirts are a perfect personalized gift to celebrate this fun event. Our Birthday Personalized Shirt is available on our premium white 100% cotton Personalized T-Shirt, machine washable in adult sizes S-3XL. Also available in Ash Gray or Pink. 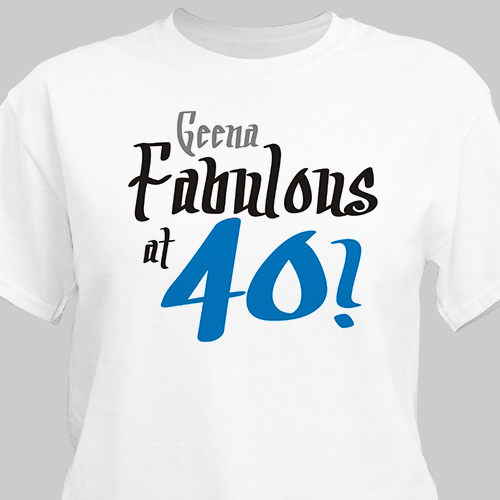 Personalize your Fabulous 40th Birthday T-Shirt with any name and age. Choose color for age. The shirt was a gift for my husbands aunt we really liked the way it turned out. The shirt was amazing and looked just like how I expected. GiftsForYouNow.com offers a large assortment of Personalized 40th Birthday Gifts. We have Personalized 40th Birthday Frames, Personalized 40th Birthday Shirts & 40th Birthday Keepsakes. Our Personalized Birthday Frames are great to give to close friends & family.